Introduction: Professional education can be a stressful experience for health-care students and may impact negatively on emotional well-being and academic performance which leads to psychiatric morbidity. The aim of this study is to assess the prevalence of psychiatric morbidity among the professional health-care students. Materials and Methods: A cross-sectional study was conducted among professional health-care students in a tertiary care teaching hospital of Telangana state. The information regarding demographic data, academic achievements, and positive and negative events in the recent past was collected using semi-structured pro forma, and the General Health Questionnaire (GHQ)-28 is used to assess the psychiatric morbidity. Descriptive analysis and Pearson's correlation analysis were done to analyze the data. Results: A total of 836 students participated in the study, and the overall mean GHQ total score in the study population was 26.8, which is above the cutoff (24) score. The prevalence of psychiatric morbidity among study population is about 58.7%. Academic achievement and negative events in the recent past had effect on psychological morbidity and showed high GHQ scores among study population which was found to be statistically significant. Conclusion: The poor academic performance and negative events had a strong impact on psychological morbidity of students. The higher level of psychological morbidity warrants need for intervention such as social and psychological support to improve the quality of life for the health-care students. Further, a creation of positive academic environment as a teamwork of faculty, administration, educational experts, and students helps to develop psychological healthy dental and medical professionals who can perform better in a coming future. Health is not only considered as just physical well-being but also mental and social well-being of an individual, thus bringing the concept of holistic concept of health. Mental health problems are a most important public health problem due to their high prevalence rates, difficulties related with the treatment, and their tendency to become chronic. Mental disorders are noncommunicable diseases which may replace infectious and communicable diseases as the leading factor in disability and premature death. One of the mental disorders which have a particularly high prevalence is depression. Other mental conditions which may result in psychiatric morbidity are stress and anxiety. Depression has been considered to be the major psychiatric disease of the 20th century. The World Health Organization (WHO) identified major depression as the fourth leading cause of worldwide disease in 1990. This suggests that depressive disorders may become the second most disabling disease of humankind by the year 2020. In the modern era because of the poor coping mechanisms of stress, every individual has ample chance of developing one or other psychiatric manifestations in their lifetime. Some of them are self limiting and not causing much disturbance in life. Other disorders can cause significant impairment in social, occupational, and functional domains. Students are subjected to different kinds of stressors, such as the pressure of academics with a compulsion to succeed, an uncertain future, and difficulties of assimilate into the system. The students also face social, emotional and physical, and family problems which may affect their learning ability and academic performance. Too much stress can cause physical and mental health problems and also reduce student self-esteem and may affect student's academic achievement. In recent years, there is a growing appreciation of the stresses involved in medical training. Medical school is familiar as a stressful environment that often exerts a negative effect on the academic performance, physical health, and psychological well-being of the student. During medical training, students are subjected to different kinds of stressors such as burden of academic pressure, an uncertain future, and difficulties of integrate into the system along with emotional, social, physical, and family problems. According to the WHO, it is estimated that 5.8% of men and 9.5% of women will experience a depressive episode in any given year. The prevalence of depression among medical students in India was found to be 71.25%. Studies on psychological problems among medical students found that these disorders are underdiagnosed and undertreated. Early detection of psychological problems shortens the duration of the episode and results in far less social impairment in long term. There are very few studies on stress among health-care students in India. Therefore, it becomes important to study the overall mental health status and prevent the ill effects of depression among medical students. 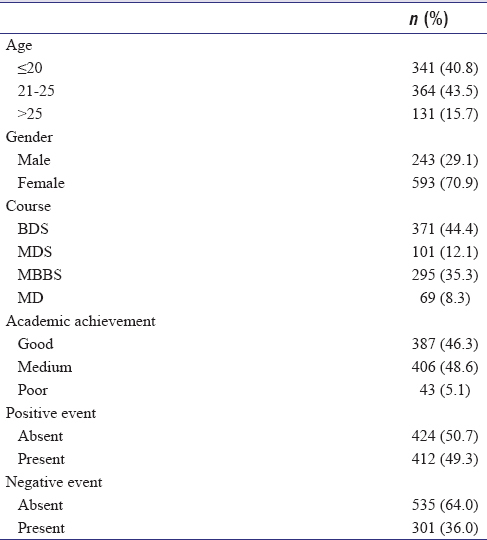 This study was conducted to assess the prevalence of psychiatric morbidity among the professional health-care students of tertiary teaching institution. To find the association between the psychiatric morbidity levels and academic achievements, and positive and negative events of study population. This cross-sectional questionnaire-based study was conducted on dental and medical students in July after obtaining permission from the ethical review board of institution and informed consent from students. Undergraduate and postgraduate dental and medical students and students who gave consent to participate and present on the day of study were included in the study. The questionnaire includes a semi-structured pro forma used for sociodemographic details, information of academic achievements, and positive and negative events in the recent past of individuals, and the psychiatric morbidity levels are assessed using a standard General Health Questionnaire (GHQ)-28. GHQ-28 had four subscales for the assessment of somatic symptoms, anxiety and insomnia, social dysfunction, and depression, respectively. The scoring was given on 4-point Likert Scale: “0” = “No more than usual,” “1” = “Not at all,” “2” = “Rather more than usual,” and “3” = “Much more than usual.” The higher the score, the poorer the psychological well-being of the individual. A total score of 24 is the threshold for the presence of psychiatric morbidity. The questionnaires were distributed among undergraduate and postgraduate students of both medical and dental colleges after explaining in detail about the study. Students from all academic years were invited to complete the questionnaire in their classrooms after lectures and during their posting hours. Participation in the study was voluntary. Each participant had taken a time of 10–15 min to fill the questionnaire. Data were analyzed using SPSS IBM Corp. Released 2012.IBM SPSS Statistics for Windows, Version 21.0. Armonk, NY: IBM Corp. Descriptive analysis was done for mean and standard deviation (SD). Correlation analysis was done using Pearson's correlation. The level of significance was set at P < 0.05. A total of 836 students of different courses voluntarily completed the study instruments. The mean age of the study participants was 21.84 ± 3.2 (SD) years. The summary of the sociodemographic characteristics including academic performance as well as positive and negative life events in the recent past of the sample is shown in [Table 1]. The overall mean GHQ-28 total score in the study population was 26.68, with a SD of 11.72, which was above the cutoff (>24) score. The mean score was highest in the subscale of “social dysfunction (8.91 ± 3.50 SD)” followed by “anxiety and insomnia (6.73 ± 4.63SD).” The lowest mean GHQ score of 4.53 ± 4.26 was found in the “severe depression” [Table 2]. More than half (58.7%) of the participant students had psychiatric morbidity (GHQ-28 total score >24). Very strong association and statistically significant correlations were found among the GHQ total score and independent variables, namely, academic achievement and the presence of negative experiences that had influenced psychosocial well-being in the last year [Table 3]. Karl Pearson's positive correlation coefficient r-values for GHQ total score with academic achievement and negative events score were 0.172 and 0.179, respectively, and P= 0.001 in both spheres which were statistically significant. The negative correlation coefficient r-value for GHQ total score with positive events was found to be −0.047 and P= 0.001, which is also statistically significant [Table 3]. 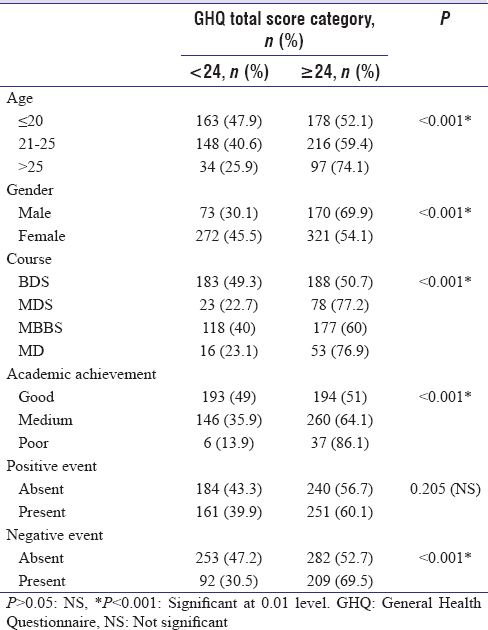 [Table 4] shows the association between various sociodemographic variables, academic achievements, positive and negative events of the study population, and total GHQ score. When comparison was done between age, gender, course, academic achievements, and negative events in the recent past with the total GHQ score, the results were statistically significant with P < 0.01. Modern medical and dental curricula require the students to develop proficiencies in various domains which include acquisition of theoretical knowledge as well as clinical and interpersonal skills. The present study examined the relationship between psychiatric morbidity measured by the GHQ-28 with positive and negative events in the recent past and academic achievement of dental students. GHQ-28 was found to be both valid and reliable for use in adults in many different countries and is a screening test used by the WHO in one of its multicenter studies. The prevalence of psychiatric morbidity in the present study is 58%, which is similar to a recent nationwide study in Turkey on the burden of diseases also found GHQ-12 scores above the cutoff (≥4) point among 56.8% of university students. A study carried out by Kessler et al., Phippen, and Kumar et al. has documented nearly similar prevalence among medical students. In a previous study conducted to assess the psychological health of undergraduates during their initial entry to the university using the GHQ, 57% of the medical students were found to have scores above the cutoff points. In a study conducted in the UK, half of the surveyed students described major stressful situations related to medical training. The number of studies among dental students at the national level is inadequate. The prevalence rates of psychiatric disorders may vary across the populations as well as in the same population from time to time. In addition, the prevalence can also show a discrepancy according to diagnostic tool used, and variation can occur due to inter-rater variability. In this study, when students were asked about the events in the last year that had influenced their psychological well-being, reported problems in academic achievement such as failing the class or poor performance, negative event such as death of a close relative, and loss of relation. Similarly, most of the students reported educational achievements such as passing the class or success in the university entrance examinations, a positive event in the family such as birth or marriage, or positive progress in their intimate relationship as the happiest event in the last year that had promoted their psychosocial well-being. In this study, we found that dental and medical postgraduates were having a high psychological morbidity compared to undergraduate students. Among the students, males are found to have higher psychological morbidity rate than females. Depression and anxiety have been associated with a lack of time for other activities and socialization according to several studies examining the relationship between sources of stress and psychological morbidity in medical students. Since the present study was conducted in a single health-care institution, so generalization of the results should be done with caution. Mental health problems among health-care professional students have been gradually increasing in recent years. From this study, we found that negative events had a strong impact upon the student to have psychiatric morbidity. The higher level of psychological morbidity warrants need for intervention such as social and psychological support to improve the quality of life for the health-care students. Our findings highlight the importance of screening medical students during training on a habitual basis to detect psychiatric distress at an early phase and taking appropriate intervention such as group counseling, stress management training, behavior therapy, cognitive therapy, and even pharmacotherapy can be considered for those affected. Further, a creation of positive academic environment as a teamwork of faculty, administration, educational experts, and students helps to develop psychological healthy dental and medical professionals who can perform better in a coming future. The escalating availability of different amenities for recreation as well as increasing effort to engage themselves in socialization can prevent psychiatry morbidity. Kaya M, Genç M, Kaya B, Pehlivan E. Prevalence of depressive symptoms, ways of coping, and related factors among medical school and health services higher education students. Turk Psikiyatri Derg 2007;18:137-46. Ramesh KT. Gangadhara Goud Prevalence of Depression among Medical and Engineering students, Bellary, Karnataka, India. Int J Sci Res 2014;3:1-2. Endreddy AR, Shaik S, Dinesh P, Prabhath K. Prevalence of psychiatric manifestations among medical students. Int J Contemp Med Res 2016;3:2641-3. Mental and neurological disorders. World Health Organization fact sheet No. 265, December 2001. Indian J Med Sci 2002;56:25-9. Kittu D, Patil R. Study of association of psychological stress and depression among undergraduate medical students in Pondicherry. Natl J Community Med 2013;4:555-8. Goldberg D, Williams P. A User's Guide to the General Health Questionnaire. Windsor: NFER NELSON Publishing Company Ltd.; 1988. Abhay MB, Krishnakumar MK, Paul NC, Shashidhar HG. Differences in perceived stress and its correlates among students in professional courses. J Clin Diagn Res 2011;5:1228-33. Goldberg DP, Gater R, Sartorius N, Ustun TB, Piccinelli M, Gureje O, et al. The validity of two versions of the GHQ in the WHO study of mental illness in general health care. Psychol Med 1997;27:191-7. Surya NC. Mental morbidity in Pondicherry. Transaction-4. Bangalore: All India Institute of Mental Health; 1964. Kessler RC, Berglund P, Demler O, Jin R, Merikangas KR, Walters EE. Lifetime prevalence and age-of-onset distributions of DSM-IV disorders in the National Comorbidity Survey Replication. Arch Gen Psychiatry 2005;62:593-602. Phippen M. The 1993-1994 Survey of Counselling Services in Further and Higher Education. Newsletter, Association for Student Counselling; 1995. p. 26-36. Ko SM, Kua EH, Fones CS. Stress and the undergraduates. Singapore Med J 1999;40:627-30. Spitzer RL. Diagnosis and need for treatment are not the same. Arch Gen Psychiatry 1998;55:120. Uner S, Ozcebe H, Telatar TG, Tezcan S. Assessment of mental health of university students with GHQ-12. Turk J Med Sci 2008;38:437-46.